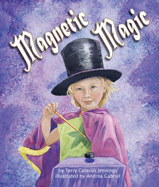 A book that shows how magnetism can be used in magic, Magnetic Magic tells an educational story in a way that is engaging to children. 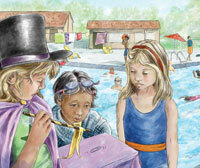 The main character, Dena, shows the smaller children some magic tricks. Enrique shows up and presents Dena with a map, daring her to find the hidden spot. Dena is unable to find it at first, then realizes that the Earth's magnetic field is the reason for that. After she realizes she's been "fooled" by Enrique, Dena decides to start showing the science behind her magic tricks. The "For Creative Minds" section in the back of the book has a comprehensive portion that explains what magnets are and how they work. It also has a page on 'Map Skills' and four activities on how to 'Make Magnetic Magic', with one of them being how to float a magnet in a pipe. Magnetic Magic is a Fall 2016 release from Arbordale Publishing. One person will win a book copy of Magnetic Magic. My daughters favorite subject/class was art, she became a super artist. My son was good in math class. It has to be reading. She is a wonderful reader and would rather do that than anything else right now. My kids LOVE magic tricks! That's something my brother in law does while we are waiting in a restaurant or when they are at his house. "Illusions!!!" The kids try so hard to re-create these tricks! They extreamly injoy science! She is beginning to learn to read and is loving it. my son loves math! my daughter is reader girl! Both of my kids really enjoy math. My niece loves reading her books to her 5 month old twin sisters showing them words and pictures. Our love science and math, but especially science. My oldest likes reading and language arts and P.E. My son loves math (I have no idea why). History is his favorite subject. My son loves math & science, my daughter is into art & language arts. My son's favorite subject is math. My friend's fourth grader seems to love art. My niece is crazy about sports. Art class is a favorite. My granddaughter loves math for her favorite subjects. I have one daughter that loves art and the other loves math. My child enjoys science and math. My sons favorite subject is math. We've seen them on the coast of South Carolina.